can also be important for the medical outcomes of a single person. in pathology reporting quality assurance. from his five different biopsies. that guides clinical decision making. And it’s not just one physician who’s seeking better reports. been among the CAP Laboratory Accreditation Program requirements. have facilitated consistent intepretation of diagnostic and prognostic data. cross-jurisdictional research and quality assurance initiatives. for surgery as well [5, 6]. College of Radiology). 2012 Apr; 24(3):177-82.
format for cutaneous Histopathology 2008 Jan;52(2);130-8.
synoptic operative report–a leap forward in the science of surgery. Annals of Surgical Oncology 2004;11(10):941-7.
reports in breast cancer –the case for synoptic reporting. Dr. Michael Misialek is Associate Chair of Pathology at Newton-Wellesley Hospital and Assistant Clinical Professor of Pathology at Tufts University School of Medicine. “How much time do I have?” was the first question Mrs. C asked. She had called me in a panic. Earlier in the week, I had diagnosed her with breast cancer. She called me after learning the bad news from her radiologist. A whirlwind of appointments with oncology, surgery and radiation oncology ensued, overwhelming her with information. I knew her case — these cells and her pathology — well, having just presented the pathology at our weekly breast cancer conference. I struggled to reassure her, telling her that treatment has advanced and catching it early was very encouraging. I am a pathologist. I spend more time studying your cells and developing a diagnosis then your other doctors spend with you. 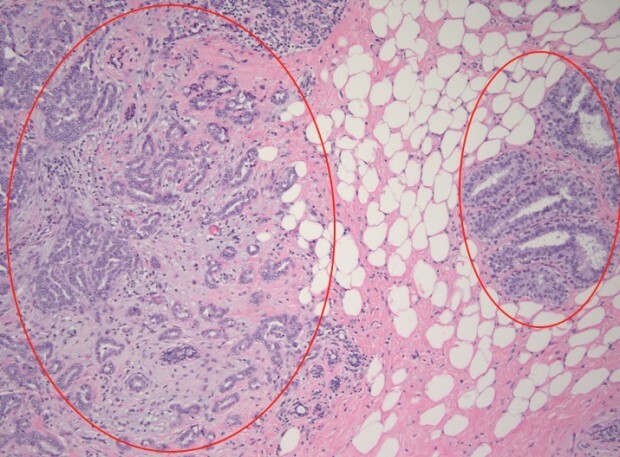 For particularly tough cases, I ask my partners for help, even send images for another opinion to my academic specialist colleagues, who may in turn show them to still more pathologists. Many eyes have likely seen your cells. Yet, I am often unseen by you, maybe even unknown. But it doesn’t have to be that way. You can request a meeting with me, you can ask — as Mrs. C did — to review your pathology, whatever the diagnosis, benign or malignant. No request is too small. Will the health care system allow for this? Won’t it resist? My colleagues from other specialties have embraced it. But currently we cannot bill for these patient consults. That’s part of my reason for writing this: We pathologists are advocating to make our consultations with patients billable, like a patient’s consultations with any other specialists. Pathologists are taking on new roles, and the system needs to change to reflect the value of pathology. My job is not just about diagnosing cancers. Anything that is biopsied, cut out of your body, scraped off, smeared, aspirated, coughed up, excreted or cultured will pass under my microscope. I discuss treatment plans with every kind of doctor: primary care, surgeons, oncologists, gynecologists, gastroenterologists and more. Pathologists are quarterbacks, calling each play, just as in football. With nearly 80% of medical care dependent upon lab tests, a care plan can only be developed with this information. This is the world of pathology. We’re in the midst of great change in medicine. With the information gleaned from sequencing the human genome, we are beginning to unravel the mysteries of cancer and other diseases. Pathologists have been key players in this discovery pipeline. Care can now be individualized. This leads to quicker diagnoses, earlier and more effective treatments and improved outcomes. Buzz words like “personalized healthcare” and “precision medicine” are becoming commonplace. ‘Is this what breast cancer looks like?’ she asked me. But this genomic revolution comes with a price tag. Most of these tests cost thousands of dollars, which creates a dilemma. The Affordable Care Act asks us to do more with less. There is emphasis on quality care that is both accountable and cost conscious. So how do we balance the two? I would argue that the answer is pathologists. We help our clinical colleagues choose the right test, for the right patient, at the right time. Choosing the “right” test often begins when the diagnosis is first made. 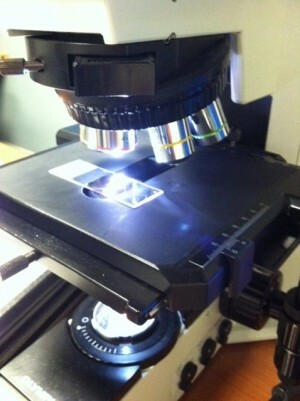 Sitting with Mrs. C, I adjusted the light of the multi-headed microscope so she could see her cells more clearly. She was silent, but I could sense her anxiety. “Is this what breast cancer looks like?” she asked me, as her eyes scanned her cells on a slide. “These are cancer cells that grow as little donuts invading the tissue,” I said, hoping to make meaning out of the sea of cells for her. A smile of relief lit up her face. “Dr. Misialek, that’s a great analogy.” Her cancer was starting to make sense to her, she said. That’s exactly what I’m here for as a pathologist. Mrs. C was undecided between lumpectomy and mastectomy. Seeing the pathology, seeing her cells, enabled her to make the decision. She chose a mastectomy, in fact a bilateral mastectomy. Often when a slide is under my microscope I feel a sense of honor knowing I am the first one to make a diagnosis that will be life-altering. Each slide speaks to me. It is my job to listen. I imagine the dominoes that will be set in motion when I pick up the phone to report my findings. It is not only bad news. Just the other day I couldn’t wait to report a benign diagnosis of a young woman’s breast biopsy. Her doctor had called me earlier looking for any preliminary information. She said the patient was in tears after the procedure, convinced she had cancer. She did not, and that made my day. A different outcome than Mrs. C., who is starting chemotherapy and radiation soon. Just recently I received a thank you card in the mail from Mrs. C. She said that having had a tour of our lab, seeing her slides and understanding how a pathologist helped her was the best part of her entire experience. It extended a warmer touch, in a world filled with barcodes, sterile instruments and starched white lab coats. You might be hesitant to seek out your pathologist. However, with healthcare reform, pathologists are becoming more and more involved with direct patient care. We welcome the opportunity. What can you do? Ask your doctor who is the pathologist and lab they use. Remember, you can always request a second opinion. Take the opportunity to look at your slides with your pathologist. It will be an enlightening experience. Be your own advocate. And know that if the system resists your efforts to meet with your pathologist, it’s not what your pathologist wants. We want to know you as well as we know your slides.